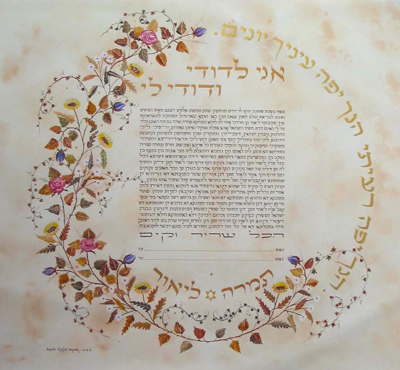 This Orthodox text written in brown on "parchment" background and surrounded with purple and pink Roses, Daisies and Sunflowers with leaves in different shades of brown. Verses from "Song of Songs" are completing the circle. אני לדודי ודודי לי is written with gold paint above the Ketubah text. The names of the Bride and Groom are at the bottom with a Star of David in between them.